The next Sandstone open meeting will be on Sunday 8th October 2017, 6pm at Bowles Rocks. Access to the Isolated Buttress will be discussed and a decision will be made following the meeting. The HRMG / BMC would like your views, both for and against a bridge. In addition, if you see any bad practice on Isolated Buttress, please can you also report it to Sarah and provide a date and time, preferably with some photo or video evidence. Bad practice consists of lowering off from the top, instead of walking off after completing a climb. Also bad rope set-ups and use of toothbrushes or boulder brushes. Continue to promote good practice, like always. 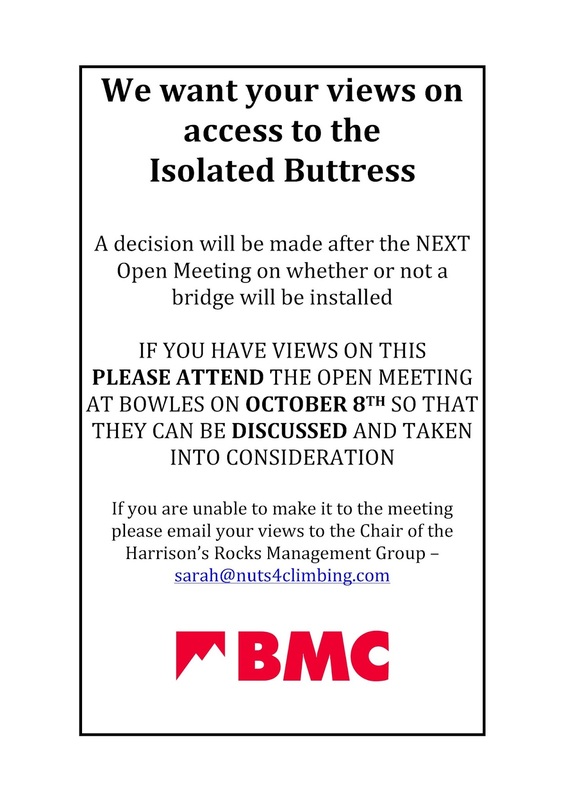 Many of you will be aware of the history of the dilemma of the Isolated Buttress, but for those of you who need an update of the past three years, you can read the past news stories HERE.